When I first got into the hobby argon-ion lasers were the holy grail for me. After several years experience playing with helium-neon it seemed like the next plausible step to a higher power visible laser. 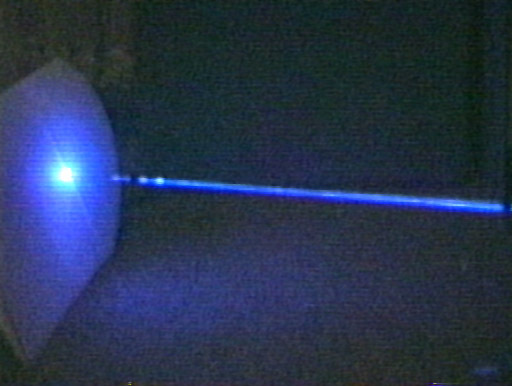 While helium-neons can produce a variety of colors other than red, an argon ion laser can produce them at much higher powers. I apologize for the low grade photos in some circumstances, my digital camera was somewhat limit when these photos were taken. I bought my first used argon-ion laser head from Meredith Instruments. It was a Cyonics/Uniphase that had some time on it. The 2214 series of lasers came in several different models in both multi-line and single-line optics with power output variations but they all had the same basic design. They are a self-contained air cooled head that was commonly used in high speed photocopier and printing machines. Due to this fact they are/were fairly common on the surplus laser market, and an easy target for someone wanting to experiment with things such as holography or low power light shows. The laser tube itself is mounted inside of a fiberglass tube which has vents cut around it near the output end of the laser. Mounted to the output end of the laser is an aperture plate and below the aperture plate is a disc shaped electronics board which includes optical feedback circuitry. On the back end of this argon laser head is a large bump which pokes out where the power and optical feedback lines also exit from. In this piggyback type module is the high voltage igniter circuitry. While any argon-ion laser can be a complex project to get running, this style of head is much easier to get running than if you just had a argon laser tube. With the igniter built in all you need is a current regulated power supply and a small voltage to trip the igniter. The other components required to run this type of laser head are a filament transformer, and a power supply. In my first tests, when I first received the tube I used a small pulsed power supply combined with a filament transformer to pulse it. The supply basically consisted of a capacitor bank charged through a bridge and high value resistor. When the capacitor reached a voltage of around 110VDC I would trigger the on-board ignitor with a 9volt battery. 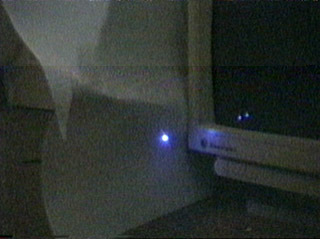 The igniter would fire and the laser would pulse for a brief moment until the voltage of the capacitor fell below the threshold required to maintain the plasma in the tube. This easy at least proved that the laser was actually capable of lasing and that my filament transformer was working okay. The photo you see below is of a pulse captured after many tries with my cheap old camera. Our next photo is of the 2214-30SLT head running on a continuous supply at about 8 amps with a lot of smoke in the beam path. This laser was tested to do 22mW @ 10 amps by the people I received it from. It should be noted that the SLT means this head has a single line output, it does not produce multiple colors like other laser heads might. If you’re interested in air-cooled multi-line lasers, check out the Cyonics/Uniphase 2214-40MLAM page for a similar laser but with 6 different lines of color. This laser head is running on a supply built using schematics from Sam’s Laser FAQ. I used modified schematics of the SG-IX design from the Laser FAQ as well. If you are building your own power supply I suggest to at least build the SG-IY with the linear pass-bank on it for current regulation. Thanks to the modularity of these supplies it can be upgraded to include light and current feedback regulation. After this laser head I also purchase a Uniphase 40-MLAM, a multi-line (multi-color) laser head that uses the same physical layout of the SLT-30 you can read about it and see photos on the Uniphase 2214-40MLAM page. Do you know where I can find a replacement laser tube for the Uniphase SLT-30 Air-Cooled Argon Laser? Check on eBay, they seem to come from some sort of large commercial laser printing equipment and show up from time to time. There are a surprising number of them out there, do an ebay search for them, save it to your web browser shortcut bar and check it every morning, something is bound to pop up. If you’re looking for something from a commercial vendor which has been tested, calibrated and characterized just search ‘cyonics uniphase’ on Google, I came up with a couple of rebuilders/sellers.